War of the Spark hype is getting very real! Already we’re seeing movement on cards based on what was spoiled, and a lot of speculative buyouts based on revealed information about the set in general. Atraxa, Praetors’ Voice is currently undergoing a buyout, and we’re likely not close to a settling price yet. This buyout was spurred on by the spoiler weekend during the Mythic Invitational at PAX East, with the announced return of proliferate. Atraxa is destined to sit upwards of $60 should this demand continue, especially considering her relatively low print run. We did see the card reprinted in Commander Anthology Vol. II, but not too many more copies were made available from this product. For those who were willing to jump in as soon as Flux Channeler was spoiled, it wasn’t hard to pick up a good percentage of the total population of Atraxa. Many Commander-exclusive cards are seeing a lot of pressure, and Atraxa is no different. As a Praetor, the card comes equipped with casual appeal, and could likely have connected items in the other four on-color Praetors for those looking to build flavorful decks. I’m thinking that the more competitive-minded players will be focused on going all in with the proliferate madness, choosing to abuse mechanics like infect to win the game quickly. Proliferate is an incredibly strong mechanic if you’re able to distribute counters across the board evenly, and cards that do this will be worth examining going forward. On the subject of proliferate, there are several cards that could be subject to demand in the near future. Contagion Engine is one of the more notable cards that can repeatedly use the mechanic, and will synergize with an artifact strategy in general. The added bonus of -1/-1 counters across the board to weaken your opponent’s creatures and keep you alive is a bonus side effect, and could lead to a board wipe with consecutive activations. Similar to Contagion Engine, Inexorable Tide will be an auto-include in counter-based Atraxa decks. It was most recently reprinted in Modern Masters 2015. It’s sitting at a relatively low price of around $3, given the possible demand it will see in the near future. There is already a small uptick from its earlier $2 price, and it could likely hit as high as $5 or more going forward. Kind of a spicier pick here, but I think Decimator Web has largely flown under the radar for a strategy like this. Seeing this artifact resolve and activated is pretty mean, and you’ll hope not to be the unlucky recipient of it. The card was only printed in Mirrodin Besieged, and foils could be an awesome pickup for explosive gains should it catch on. Mycosynth Lattice was recently reprinted in Battlebond, and if we can take the recent Karn, The Great Creator spoiler to be real, this enables you to tutor any card from outside the game you own into your hand. This will be significant for Commander play mostly, and we’re already seeing a lot of these go out the door. There’s still room to get in under the $20 mark, but I would not be very keen on picking these up past that point. I’m noticing a pattern here. Most of the cards I’ve mentioned above are Mirrodin- and Scars of Mirrodin-block artifacts with absurd effects. Knowledge Pool is seeing a small uptick from below a dollar currently, and could end up much, much higher. 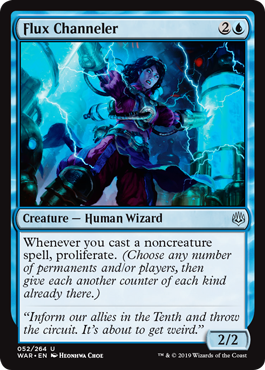 We’ve recently seen Modern chatter about this card when Saffron Olive covered it in his Against the Odds series, noting its game locking interaction with Teferi, Mage of Zhalfir. The printing of the new three-drop planeswalker Teferi, Time Raveler offers a similar way to set up the lock. The Chain Veil continues its upward trajectory we’ve seen since the announcement of War of the Spark, though is starting to slow down a bit. The appeal of multiple planeswalker activations will keep pushing this card to new heights. I think this card is destined to pass the $30 price point, especially if it dodges this year’s Commander print cycle. It’s always worth taking a look at Doubling Season when you’re talking about planeswalkers, proliferate, or really any reference to EDH in general. This card is somewhat of a signpost for Commander-related finance, and will always be a relevant player regardless of the number of printings it sees. It continues to climb towards what I estimate will be $50 a copy as a fair market price, and likely around $60+ at most retailers. I don’t necessarily recommend going deep on picking these up, but I wouldn’t be getting rid of them either. I talked about Deploy the Gatewatch in my article All About Eldritch Moon weeks ago, and I believe we still haven’t quite reached the ceiling for cards like this. Oath of Nissa and Call the Gatewatch are in a similar situation, and will likely be more desirable once packs of the new set are available. Effects like this play nicely with the new walkers we’ll be receiving, and the downshifted rarity of War of the Spark‘s cast will give players on a budget a chance to actually build this strategy. What’s more, having an even wider selection of playable planeswalkers will allow these decks more flexibility in the walkers they choose. Last up, I’d like to leave you all with some food for thought. While this spoiler season is not too dissimilar to ones we’ve seen before, I’d like to note that Magic: The Gathering has never had more eyes on it than now. The Mythic Invitational was a huge event that brought our game to the front page of Twitch, and the War of the Spark teaser trailer has gone practically viral. At this time it has 6.7 million views, and will likely keep climbing. Considering these things, I think many of our expectations of the market are about to undergo a shift of sorts. Arena will eventually be out of the open beta stage and will be a full release, likely with a ton of hyped advertising to go along with it. It’s an exciting time to be involved in Magic, and I think a lot of new, unprecedented investment opportunities will be opening up soon.